We are still enjoying sharing orchid species that featured on our London display – and are still flowering for us at Writhlington. 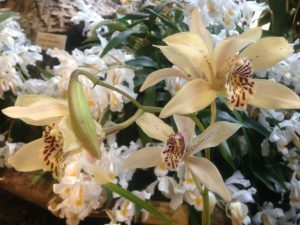 Cymbidium insigne is the species behind most hybrid Cymbidiums. Its large flowers come in shades of white, cream and pink with delicate spotting especially on the lip. We have this lovely creamy clone with bold red stripes on the lip. Cymbidium insigne is a terrestrial species found in the mountains that straddle Northern Thailand, Northern Vietnam and Southern China. It grows in poor soils in the vicinity of Rhododendron species that it mimics. 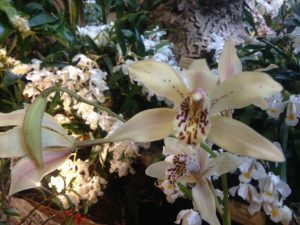 Bees mistake the Cymbidium flowers (which have no reward) for nectar filled Rhododendron flowers allowing the orchid to gain pollination with minimum use of scarce resources. The flowers are long lasting and held on tall slender spikes with flowers well clear of the foliage.